A suite of samples was collected from the run-of-mine dumps at the El penon mine, as underground access was unavailable. 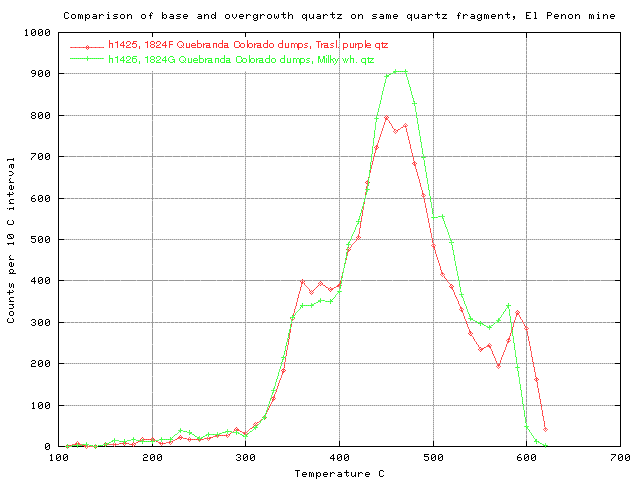 3 sets of samples were collected from the Quebrada Orito dumps, and one sample set from the Quebrada Colorada dumps. These samples all had significant decrepitation intensities, which implies that the fluid inclusions are dominantly liquid and that they formed at relatively high pressure at considerable depth. This is unusual for an epithermal deposit formed in a surface environment and El Penon would seem to be of very deep epithermal or perhaps mesothermal origin. Many samples also have a distinct early decrepitation peak near 350 C which is indicative of the presence of high internal pressure CO2 rich inclusions, which also points to a deep origin for this deposit. There was no consistently recognizable difference between results from the 2 different vein systems and both these veins seem to have formed under similar or identical fluid conditions. 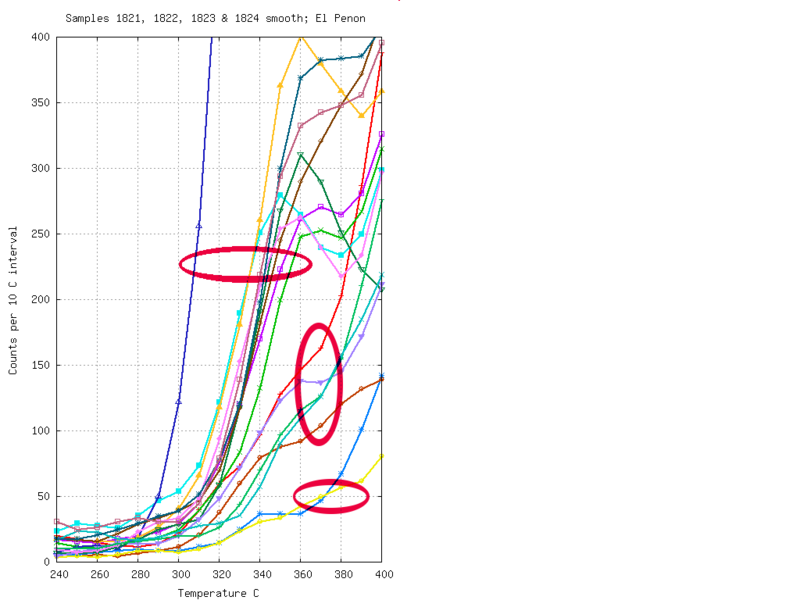 A plot of all these results on one graph shows 3 separate types of sample, based on their CO2 levels as indicated by the decrepitation near 350 C. 10 samples have distinct peaks caused by substantial CO2, 5 samples have modest CO2 contents and only 2 have no detectable CO2. These sample groupings are shown on the following diagram which accentuates the low temperature decrepitation region. The triple peak response from El Penon samples is typical of samples from Au deposits where CO2 rich fluids occur. In this case the lowest temperature peak at 350 C is quite high, based upon which we infer that the partial pressure of CO2 in this system is quite low. 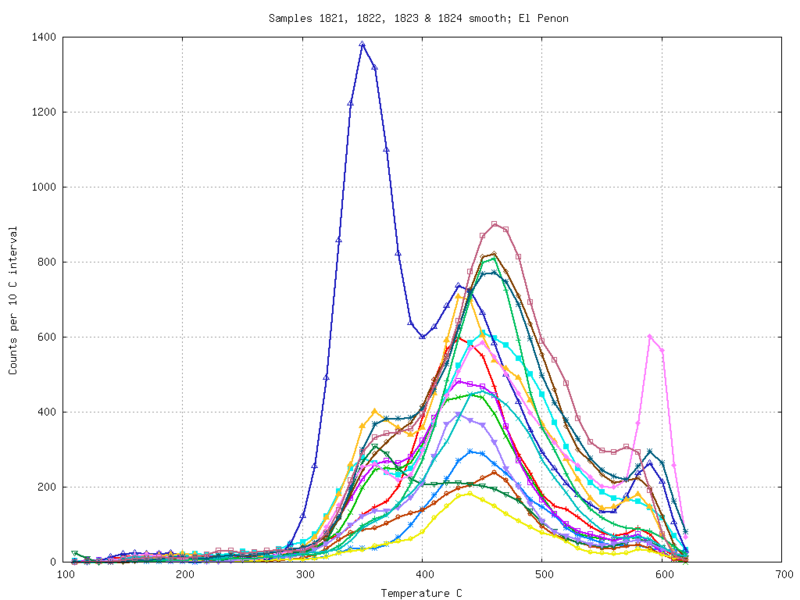 (In archaean Au systems this first peak is often near 250 C.) Samples from the Au deposits in Nevada lack CO2 and the consequent low temperature decrepitation peak, so the El Penon deposit seems to be a high level system, but deeper than typical Nevada systems. The peak at about 420 C does vary slightly between samples and suggests it may be possible to map out palaeo-thermal gradients in these veins, given a proper spatially located sample suite. 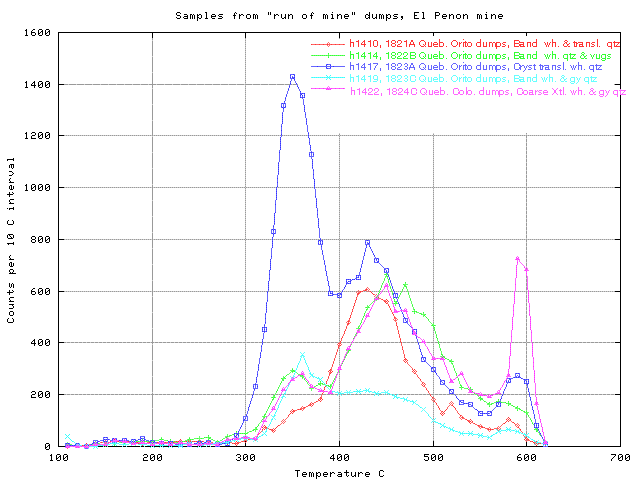 The temperature of the ore forming fluids was about 350 C. As all of the samples collected were from the "run of mine" dumps we inspected, it is impossible to infer any spatial relationships from these samples. Two of the samples collected showed strong quartz zonation with the fragment (about 2 cm across). Each of these samples was split into an early milky quartz and a late stage, clearer and more coarsely crystalline overgrowth quartz. In the above plot of samples 1824F and 1824G, these two types of visually distinct but very closely associated quartz, showed no discernible difference in fluid inclusion content. (The other sample pair showed the same self-similarity.) This confirms the interpretation that the El Penon system was formed during a single thermal event with remarkably little thermal variation within the system either spatially or temporally. Decrepitation analyses show that the El Penon Au deposit formed from fluids with moderate to low levels of CO2 and with little spatial and temporal variation across the deposit. The deposit must have formed at reasonable depth in order to capture these high pressure CO2 rich fluids. It's origin is deeper than usual for typical epithermal deposits. Variations in the CO2 contents permit the recognition of several different sample groups, despite the lack of any visible differences and this information may well assist in outlining potentially mineralised zones in the veins.